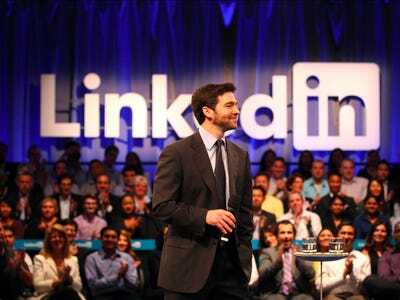 Stephen Lam/Getty ImagesJeff Weiner, CEO of LinkedIn. Good morning! Here’s the tech news you need to know this Tuesday. 1. Apple CEO Tim Cook will fundraise for Republicans. Cook is hosting a private breakfast for House Speaker Paul Ryan. 2. Peter Thiel, the billionaire investor who waged a secret legal war against Gawker, is remaining on Facebook’s board. CEO Mark Zuckerberg opted not to remove him at the company’s annual shareholders’ meeting on Monday. 3. Tech companies absolutely dominate LinkedIn’s new list of the top places to work. Google is number one. 4. Taylor Swift, Paul McCartney are among 180 artists calling for reform of the Digital Millennium Copyright Act. The musicians believe the US copyright law is benefiting YouTube unfairly and making it harder for them to make a living, Billboard reports. 5. Dell is selling its software business for more than $2 billion (£1.4 billion). Buyout firm Francisco Partners and the private equity arm of activist hedge fund Elliott Management are the buyers. 6. Google is moving 2,500 staff into a new London office with a running track. The new office is at Kings Cross, London. 7. Microsoft just slammed Google Chrome’s biggest problem. The web browser is a battery hog, and Microsoft is hammering this point as it promotes its own Edge browser. 8. Twitter paid $150 million (£102 million) to acquire a London startup called Magic Pony. The company works on machine learning, a type of tech related to artificial intelligence. 9. Cyber researchers have confirmed that Russia was behind the hack of the US Democratic National Committee, according to The Washington Post. A hacker called “Guccifer 2.0” has been leaking internal documents from the party, but researchers believe this is a diversionary tactic by the real attackers. 10. Spotify has 100 million monthly active users, The Telegraph reports. The Swedish company is adding 1.8 million new users every month.